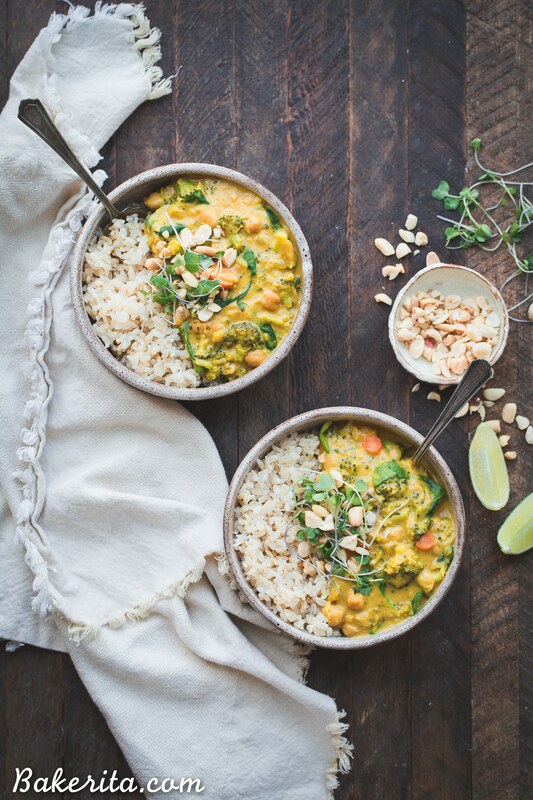 This Broccoli Chickpea Curry is a dinner staple that’s so quick and easy to make! It’s loaded with veggies and protein and has a secret ingredient to make it extra rich + creamy. It’s gluten-free and vegan, too. I’ve been making this broccoli chickpea curry for a few months now when I want an easy, rich, and filling meal. It has quickly become a fast favorite of mine and of course, it makes amazing leftovers too. Every time I shared it on my stories when I was cooking it at night, you guys would always ask for the recipe. But of course, it was night, the light was bad, and I couldn’t photograph at the moment. So I’d inevitably forget, until the next time I made it…when a bunch of you would ask again. Finally, I remembered to make it in the morning to photograph for you guys, and it’s HERE!!! One of my favorite dinner recipes can now be on your table, too. 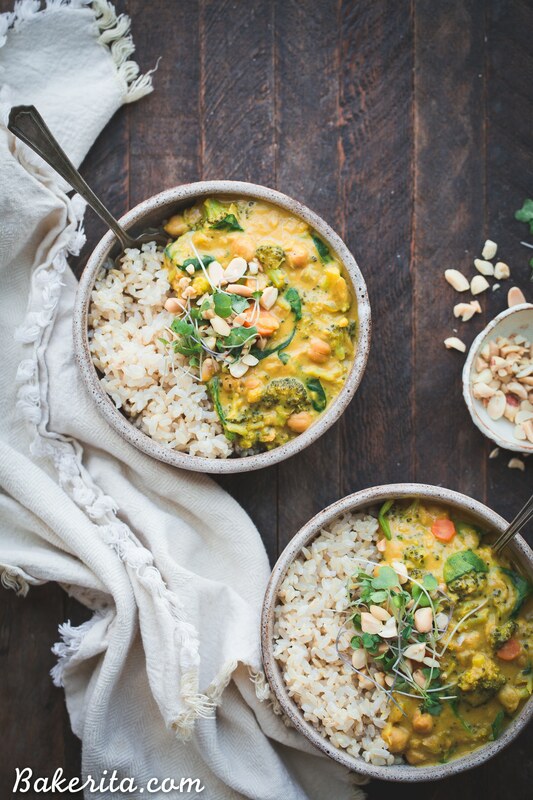 This recipe is inspired by a curry I got from a farmer’s market stall where they were selling West African food – it was a broccoli sweet potato and peanut curry, and it was so luscious and creamy and absolutely swoon-worthy. I got home and set out to recreate a similar version for myself. 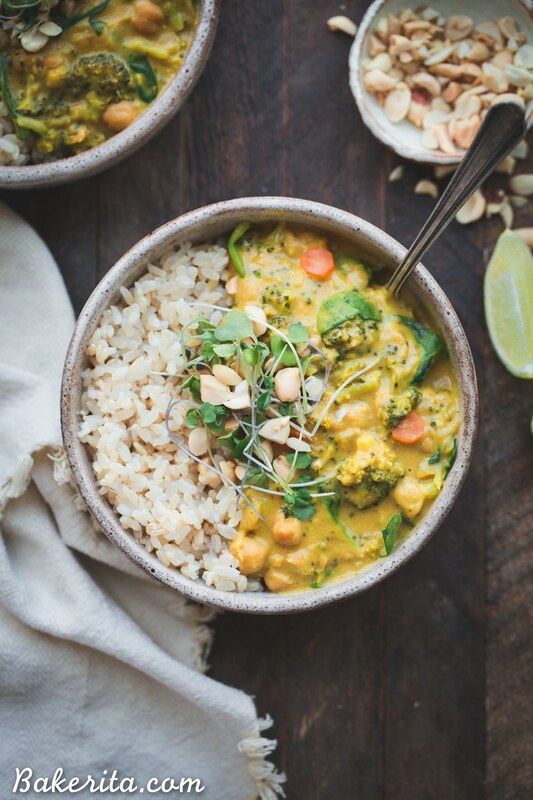 Broccoli Chickpea Curry – the best dinner! 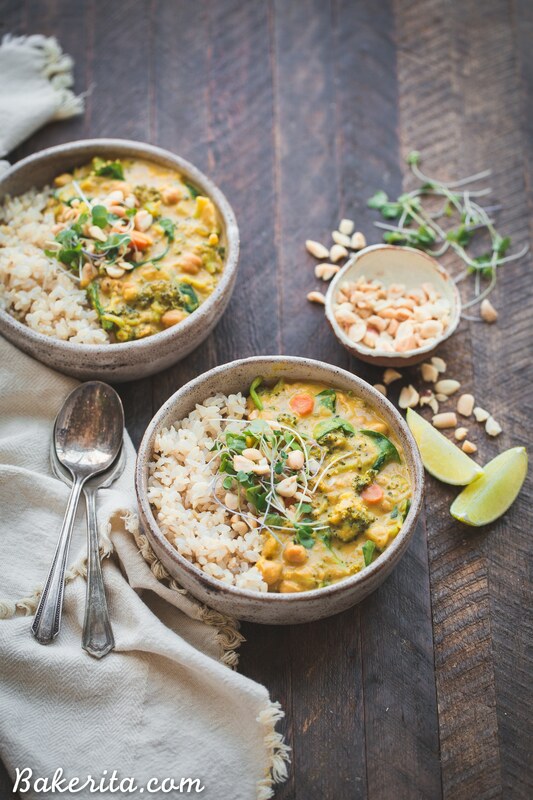 I kept things pretty simple, with lots of veggies, lots of spices, a can of coconut milk, and the secret ingredient – peanut butter. There’s not enough in there to make it overwhelmingly peanut butter-y, but it adds this richness to the curry that’s so good. It also helps thicken it up a bit, making a nice creamy sauce. As opposed to the farmer’s market version that inspired this, I went for chickpeas instead of sweet potatoes to add some protein. I also stirred in some fresh spinach right at the end, for a pop of green. I love serving the curry over rice (quinoa or cauliflower rice would also work), topped with a squeeze of lime, some chopped peanuts, and microgreens. It’s so hearty and fills you up without making you feel gross. 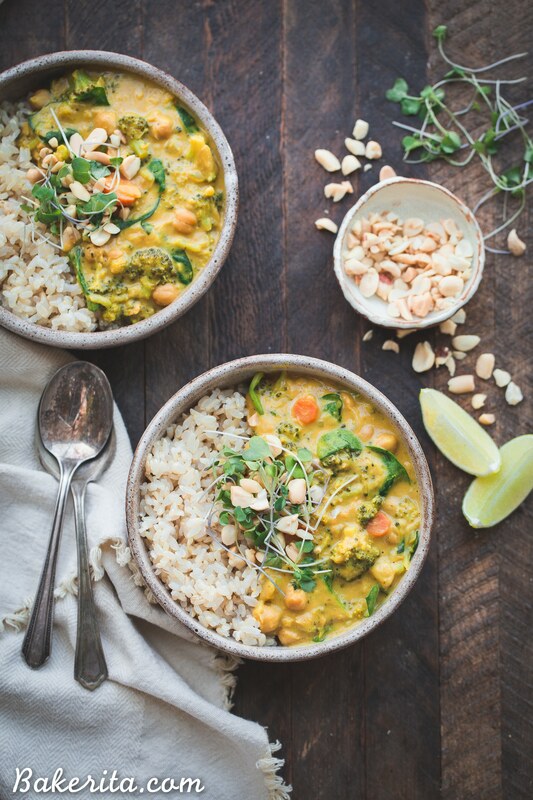 This Broccoli Chickpea Curry is a dinner staple that's so quick and easy to make! It's loaded with veggies and protein and has a secret ingredient to make it extra rich + creamy. It's gluten-free and vegan, too. Heat a medium-sized saucepan over medium-low heat. Add the oil and onion. Saute until translucent, about 5 minutes. Add the garlic, fresh ginger, turmeric, ginger powder, curry powder, garlic powder, and salt and cook for another minute. Add the carrots, broccoli, chickpea, coconut milk, and vegetable broth. Bring to a simmer and then cover and let cook for 10 minutes, or until the broccoli is tender. Stir in the peanut butter and then add the fresh spinach and stir until wilted. Add the lime juice into the curry and stir it in. Serve over rice with lime wedges, chopped peanuts, and/or microgreens. So glad your family is enjoying the recipe!! Sounds great over noodles too :) thanks for your feedback! So glad to hear you’re enjoying it!! Thanks for the feedback, Jolie. Any suggestions for substitutions for the peanut butter? I want to serve this to a crowd, so I want to be sensitive to nut allergies. Thanks! Sounds delicious! This is Joy (Steven’s Joy). I just wanted to tell you that my daughter Emileigh and I just made this and we absolutely love it. I have never made any kind of curry dish and she has been wanting to so we decided to try it. Very yummy with so many flavors! I will definitely be making it again. So happy to hear that you and Emileigh enjoyed it, Joy!! That makes me so happy to hear :) hope you’re doing well!